My favorite sofa brand for a modern interior is definitely Minotti. 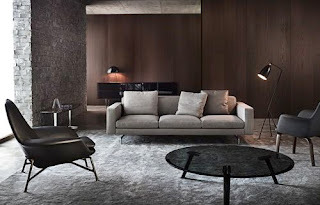 As far as I'm concern, there are no one out there who makes a sexier, sleeker, and more gorgeous sofa out there for a contemporary interior than Minotti. Sofa is the center piece for a living room hence it's always advisable to get the best sofa one can afford. After all, it is the most used piece of furniture in a living room and is most likely the largest piece of furniture in the space. A great looking sofa can elevate the whole room while a cheap dumpy sofa can definite make a great room look dingy. I like this particular sofa (Sherman.93) not only it's a great looking with great proportion, it also sits quite comfortably. I love the legs on this sofa. The skinny legs lift the sofa up which give an illusion that the sofa itself is light, airy and comfy. This is very hard to do since most sofas look blocky and heavy. You can find Minotti sofas at their exclusive showrooms in NYC, Chicago, LA, and SF. You can also find them through their extensive dealers throughout US. Recline in your favorite position with this comfortable recliner and ottoman set. This set features thickly padded arms and leather wrapped bases. This top rated recliners review top rated recliners review is very useful product.